I’ve been with Premier Travel since joining in 1984 – I’ve always been based at Ely, and worked up from trainee to my current role of branch manager. USA: Florida, Las Vegas, Chicago & Seattle The Caribbean & Bermuda Thailand: Bangkok, Koh Samui, Khao Lak, Phuket & Elephant Hills Europe: Spain, Portugal, Greece, Cyprus. 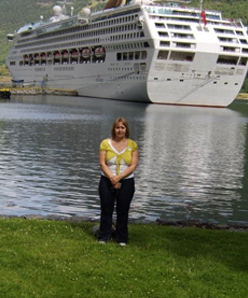 Lots of cruises; a few European, two Caribbean, and one around the Norwegian Fjords. As I enjoyed Thailand so much I would like to see more of the Far East. Thailand – it’s somewhere completely different to anywhere I’d ever been before and I loved everything about it – the people, the amazing hotels, the culture, and the scenery is beautiful too. The experience of getting up close with the elephants at Elephant Hills in Thailand – it was out of this world and so different to anything I’ve ever done before. If you’re travelling as a family or a group then split up your luggage between you, so that you each have something of each other’s in case you need it. I’ll strive to source the best option to suit your needs, nothing is too much trouble, and I’ll do everything for you from the paperwork beforehand to booking your seats! My kindle and ipod – I like nothing better than sitting on a sunbed with my kindle!